In NASA's video of the mass ejections of solar matter, they look powerful, even angry — like massive solar blisters. As NASA says, "One of the most dramatic features is the way the entire surface of the sun seems to ripple with the force of the eruption." The flares took place about an hour apart. And when they hit Earth, the waves of magnetic fields may disrupt power grids, as well as radio-based communications. But the phenomenon might also bring auroras to the skies above residents of the northern United States, according to an interview with NASA solar physicist Alex Young, over at The Los Angeles Times. "NASA models using data from the Solar Terrestrial Relations Observatory (STEREO) and the Solar Heliospheric Observatory (SOHO) have now provided more information about the two CMEs associated with the two March 6 flares." "The first is traveling faster than 1300 miles per second; the second more than 1100 miles per second. NASA's models predict that the CMEs will impact both Earth and Mars, as well as pass by several NASA spacecraft – Messenger, Spitzer, and STEREO-B. The models also predict that the leading edge of the first CME will reach Earth at about 1:25 AM EST on the morning of March 8 (plus or minus 7 hours)." We can only hope that the most worrying thing about that note is that NASA has followed the cable TV industry's lead in making their time estimates coincide with an entire workday. "Terry Kucera, a solar physicist with NASA's Goddard Space Flight Center, told Fox News that the tornado might be as large as the Earth itself and have gusts up to 300,000 miles per hour. By comparison, the strongest tornadoes on earth, F5 storms, clock wind speeds at a relatively paltry (though incredibly destructive) 300 mph." And our colleague at the 13.7 blog, Adam Frank, has also explained "space weather" in very clear terms. To learn more about solar phenomena, you can visit NASA's page of Frequently Asked Questions — it starts off with, "Is the world going to end in 2012?" 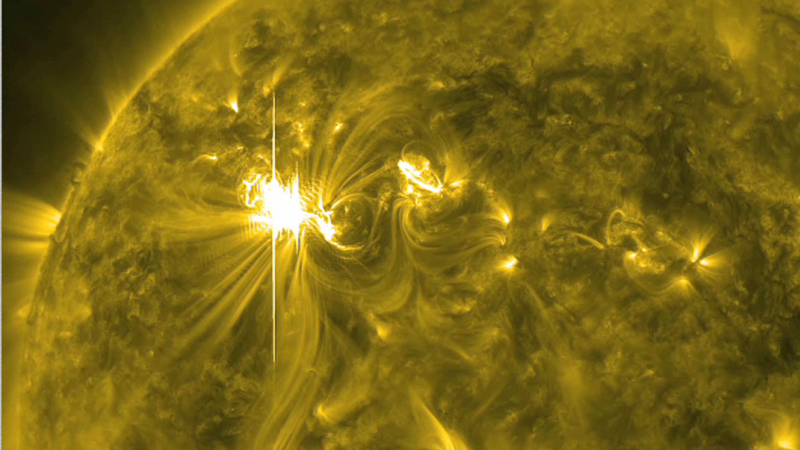 This image of a huge and powerful solar flare was captured by NASA's Solar Dynamics Observatory Tuesday.